Having a UR5 robot tend four CNC machines milling dental crowns optimizes a substantial part of the production cycle at Glidewell Laboratories in Newport Beach, California. It usually takes five days from when a dentist sends an impression of a patient’s teeth to the lab, until the finished crown returns. A process, that Glidewell Dental Laboratories wanted to optimize. 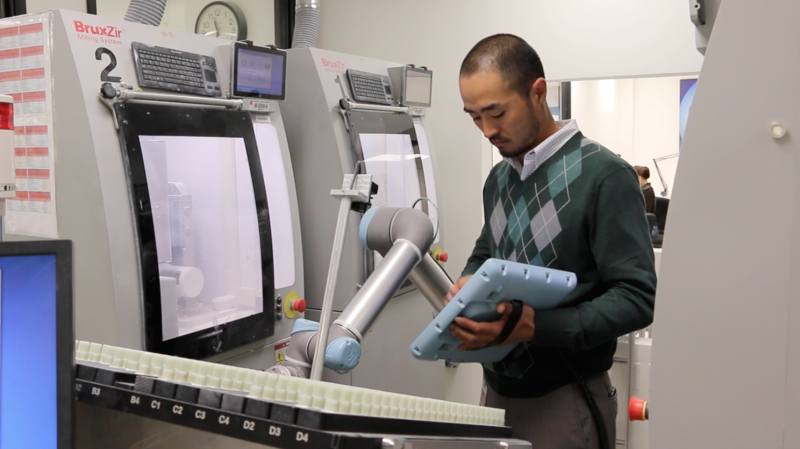 David Leeson, engineering manager at Glidewell, had his eyes on Universal Robots’ collaborative robot arms as he researched potential automation solutions. “I had followed the collaborative robot development for a while, and hearing that the UR robots were used at BMW was a vote of confidence in this new type of robot. I finally got to play around with a UR5 at Automate 2013 and realized it was a real industrial piece of machinery and not just a toy,” says Leeson, who bought the first UR5 robot in 2012 and is now waiting for the seventh to be delivered. The UR5 robot picks a crown to be milled from dispensers with blanks in 16 different shades. The UR5 places the blank in the milling lathe, picks it back out and places it on a conveyor after the 10 minute milling cycle. A vision camera monitoring the dispensers with shades communicates with the robot. If a dispenser is empty or jammed, the vision guidance enables the robot to work on a crown in a different shade, ensuring continued production while an operator can be alerted to fix the dispenser issue. Since the milling cycle is 10 minutes, it was not feasible for Glidewell to have an operator stationed at the machine to manually load and unload each blank. Instead, the lab inserted the crowns in batches of 15 each which only needed to be done every two hours. “But now with the UR robot, we can insert each blank immediately into the mill when we receive the CAD scan without waiting for 15 cases to arrive, having the operator nest them into the 15 piece block,” explained Leeson. Achieving a dynamic, single part flow with the UR5 robot has cut the production cycle time from 28 to 17 hours. “That is less time that our customers are waiting and it has efficiency benefits throughout our process,” says the engineering manager. The optimized production cycle also means that Glidewell can save two operators per shift in the milling room. “We run a 24/7 operation and the robot has freed our employees up to focus and improve on handling the complex tasks which also improves our overall product quality,” says Leeson. Being “collaborative” means that the UR robot can work without any safety fencing directly next to employees due to the built-in force-sensing technology enabling the robot to stop operating if it comes into contact with an employee. “In our history of automation, we used conventional industrial robots. We had to build a large enclosure and separate the people from the robot, which is expensive, takes up space, and is less flexible. It is also a safety concern if somebody defeats the interlocks on a robot enclosure. 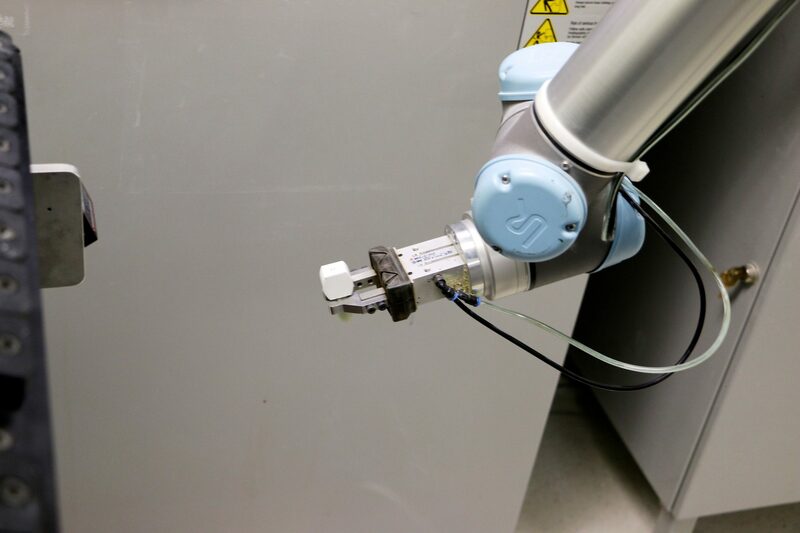 We don’t have to worry about that with the force sensing in the Universal Robot,” says Glidewell’s engineering manager, who thinks the collaborative robots heightened the awareness of the benefits of gradual transition from manual to automated processes. Automation engineer Daniel Phee had not worked with collaborative robots before and was surprised at how easy it was to program the robot. “The interface on the touch screen makes it very easy to program the robot. I used a combination of the teach method and my own script,” says Phee. “I really liked how reliable the UR robot is, you don’t have to worry about maintenance and we have had no big operation issues come up.” The teach method allows the user to simply grab the robot arm and move it through the way points in the desired task. It took Glidewell about 5-6 months to fully integrate the first application, but this was mostly down to building custom milling machines and working with heavy IT infrastructure. “But after this it was easy. With the next robots, it only took us 2-3 days to install the complete system,” says Daniel Phee. David Leeson was struck by the fact that interfacing with external equipment was a native capability of the UR robots. Glidewell Laboratories has grown every year since its inception. David Leeson sees robotic automation as key to sustaining this trend. “We will likely get 3-4 more UR robots in the near future. The only limiting factor right now is that we need more blocks for the individual crowns. As soon as we have those, we’ll get more robots to handle the one crown one batch process. We’re also looking into automating other steps in our production where we see the UR robots playing a key role.” Repeat customers make up an increasing share of the business now, said Phil Hollingsworth, Senior Application Engineer with Sparkem Technology – distributor of Universal Robots in Southern California. Universal Robots is a result of years of intensive research in robotics. The six-axis robot arms weigh as little as 40 lbs. with reach capabilities of up to 51 inches. Repeatability of +/- .004” allows quick precision handling of even microscopically small parts. After initial risk assessment, the collaborative Universal Robots can operate alongside human operators without safety guarding. 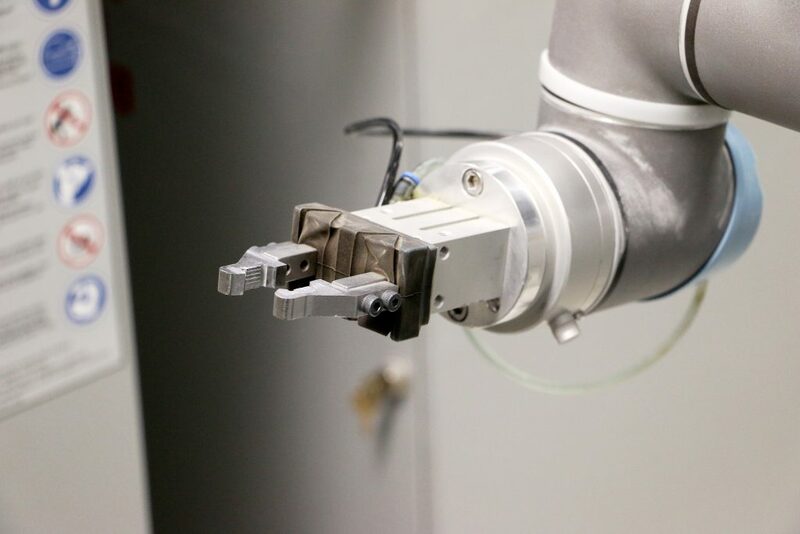 If the robots come into contact with an employee, the built-in force control limits the forces at contact, adhering to the current safety requirements on force and torque limitations. Intuitively programmed by non-technical users, the robot arms go from box to operation in less than an hour, and typically pay for themselves within 195 days. Since the first UR robot entered the market in December 2008, the company has seen substantial growth with the robotic arms now being sold in more than 50 countries worldwide. The company is headquartered in Odense, Denmark where all development and production is carried out. For more information on Universal Robots, visit www.universal-robots.com. Glidewell Laboratories, based in Newport Beach, California, is an industry-leading provider of high-quality dental lab products and services to dental professionals nationwide for a low cost. Established in January 1970, the lab specializes in crown & bridge, ceramic, removable full and partial dentures, dental implants and prosthetic components, and full-cast restorations. For more information on Glidewell Laboratories, visit www.glidewelldental.com.